Apple is celebrating the summer solstice this year by making the next major reference release of its mobile operating system available, for free, on Monday June 21st. The new iOS 4 will provide existing iPhone and iPod touch users with a system-wide upgrade and pave the way for the iPhone 4 launch on Thursday. Apple's iOS 4 provides a variety of new and enhanced features on a core OS level, on a developer API level, and on the surface for end users. Some of these features are limited to new hardware in the latest iPhone 4 (such as FaceTime video calling), while others are only available on last year's iPhone 3GS and third generation iPod touch (including multitasking). iOS 4 is not supported on the original 2007 iPhone and iPod touch models, and can't be installed on iPad. Apple says a later release this fall will bring iOS 4 features to iPad users, much like the special iPhone OS 3.2 that was exclusive to the iPad at its launch. For all other iOS device users, iOS will be made available for immediate download as a software update within iTunes; that's an distinct advantage Apple holds over most other smartphone platforms, where users might wait months for a new software update to be made available by their mobile provider and for their specific phone model. 1. A revised look and feel reminiscent of the Mac OS X desktop, including a glass shelf Dock, translucent status bar, and support for custom wallpaper on the Home screen. Gone are Apple's efforts to differentiate the iPhone and iPod touch by giving each a different dock design and withholding apps from the touch. The only real differences between the iPhone and iPod touch now relate to hardware, and iOS 4 works to abstract away any differences wherever possible. 2. Support for iTunes "File Sharing," which copies documents associated with a specific app on or off the device when it syncs with iTunes. iOS 4 also exposes the concept of opening email attachments with a particular app, another feature that debuted on iPad. 3. Support for suggested search terms in Safari when users begin entering a query. 4. HTML5 videos can now play within the browser window, rather than launching the QuickTime full screen player, similar to how iPad works. 5. Support for Apple's iBooks ebook reader and store app, which now also functions as a PDF document library and viewer. 6. Support for Bluetooth keyboards and for system-wide spell check, word suggestion and replacement, and other developer-extendable features that can be included in the text selection copy/paste menu. International layouts on the virtual keyboard can also now be selected from a contextual menu rather than just cycling through multiple configured layouts by hitting the globe icon. 7. iPod music playback now gets album art in its listings, and presents additional metadata for the currently playing song or podcast when the user brings up playback controls. Users can also create playlists on the device, rather than only syncing configured playlists from iTunes or only creating simple iPod-style "on the go" playlists. 8. A software orientation lock, like the iPad's hardware switch, enables users to keep their iPhone from flipping back and forth between landscape and portrait when holding the device perpendicular to the ground (such as when lying in bed). In iOS 4, the orientation lock is presented when you double-click on the Home button and swipe to the left. Also available in this menu are background audio controls, which default to iPod playback but can also be used by third parties with apps that support Background Audio multitasking (something that isn't yet available on iPad). 9. A new Location Services icon in the menu bar that flags when the current app is accessing your location, either using GPS or WiFi triangulation. Apple reports this to the user for privacy reasons, and also forces apps to request permission to perform location lookups via the operating system, so that apps can't track users' location without their being aware that Location Services are active. In iOS 4, there is also now per-app preferences for enabling or disabling specific titles from determining location. Apps that lookup the user's location are flagged on the Location Services page within Settings so users can track which apps are tracking them. iPad does not yet expose this new fine grained control in its Location Services preferences. 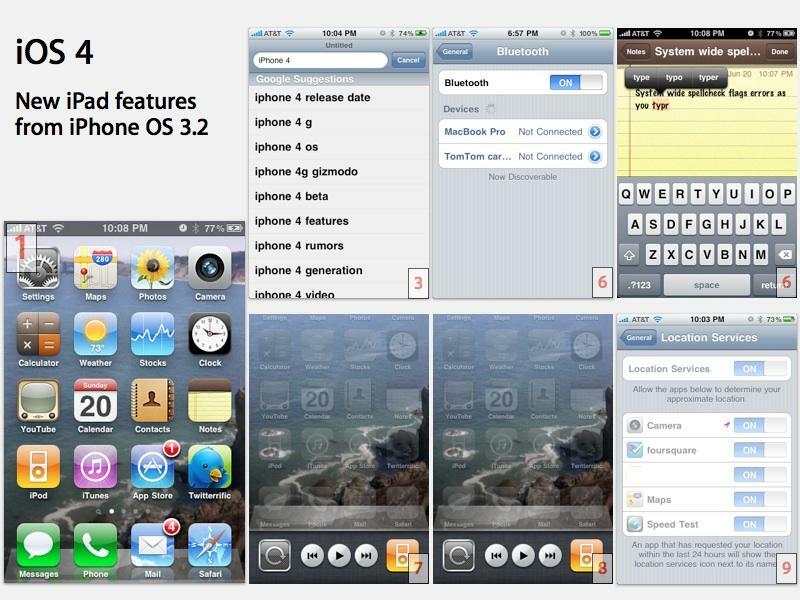 On page 2 of 3: New user features in iOS 4.